It is your mission to find your father and the precious Mayan relics! 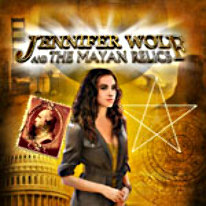 Jennifer Wolf leaves San Francisco to join her father on the archaeological dig he is leading in Mexico.When she arrives on site, she can't find any trace of him and all his belongings have been ransacked. Prior to his disappearance, he managed to hide a certain manuscript - a book, dating from the 16th century, telling of the last sacred Mayan calendar which had been broken up into five separate fragments and entrusted to selected guardians to ensure its protection. It is your chance to discover the secrets of the precious Mayan relics in an adventure simply filled with twists and turns!